Beijing was blanketed in yellow dust this morning as a sandstorm that has been buffeting much of the country’s northwest hit the capital, prompting government health warnings. The city government raised its pollution warning to the highest level yesterday in anticipation of the storm and urged people to stay home and to wear masks if they need to go outside, according to China Meteorological Administration. Streets, buildings and parked vehicles were covered by dust and visibility was reduced in the morning, though by lunchtime, the storm had abated and skies were back to normal. The sandstorm, the biggest this year in China, is moving east and may continue to bring loose soil and dust to the northern part of the country tomorrow, according to the weather authority, BusinessWeek reported. The storm also hit Xinjiang and Inner Mongolia, Shanxi, Shaanxi and Hebei. On Saturday it had spread over an area of 810,000 sq km with a population of 250 million. In the 35 hours up to 1100 on Saturday (0300 GMT), 270 million people in an area of 1.8 million sq km had been affected, official news agency Xinhua reported. The capital's meteorological service bureau has announced a level 5 warning, the highest, in the city due to pollutants in the air, and has also advised residents to use caution if they leave their homes. 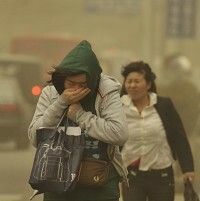 Heavy sandstorms in Beijing are rare, though in other parts of inland China they do occur, according to RIA Novosti.